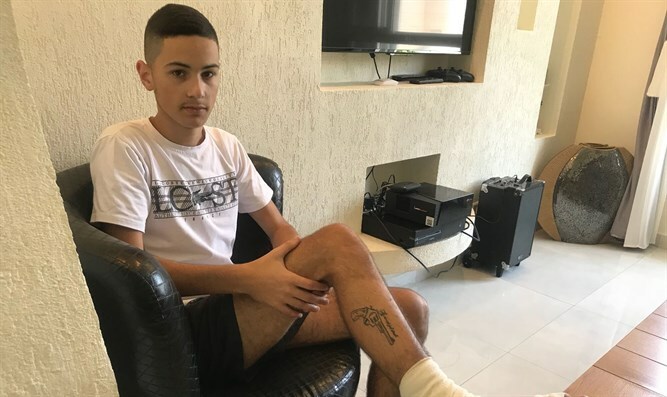 Sixteen-year-old Yarin Shitrit, who was wounded in the leg yesterday (Wednesday) while running to a protected area during the barrage of rockets from Gaza, spoke to Arutz Sheva about the lack of freedom residents of the south have while under fire. Yarin said that he saw that his leg had a red color while we was running to the security room. It was only after a while did he begin to feel the pain: "My entire leg became blue and swollen. I felt pressure and I was shaking all over my body." "It shouldn't be like this," he said. "We need to respond as much as we can. Every time they ask for a truce we give it to them and it shouldn't be like that in my opinion. We've been absorbing this for 19 years before I was even born, I think." Yarin said that the situation is difficult even when there is a 'drip' of rockets from Gaza instead of the massive barrage which was launched last night. "Three weeks ago, [a rocket] fell on my aunt's house and she was hit in the head and face by shrapnel. We need to protect the residents and probably add more Iron Domes because if it continues this way, people can get hurt left and right." Tags:Sderot, Gaza Region, rocket attacks.